If you’re a distance runner you must train frequently to build the endurance necessary to run for miles at a time, which makes the treadmill a handy tool, particularly when the weather is bad. If you don't want to run marathons but do hope to improve your fitness, the treadmill can help you, too -- if you can keep going long enough. In either case, building endurance while you're using the treadmill can help you achieve your goals. Warm up for the first five to 10 minutes of your workout by using the treadmill at a moderate level. Work hard enough to sweat a bit, but not so hard that you’re out of breath. Perform weekly sprint intervals. Although you won’t sprint during a distance race -- except maybe at the end if you’re trying to beat someone to the line -- sprint training can improve your cardio endurance. Begin by running at a moderate speed for about 90 seconds and then sprinting for 30 seconds. Continue the pattern for 20 to 30 minutes. As you progress, increase the speed of both the fast and slow intervals to further improve your endurance. Run a straightforward endurance session at least once each week. If you’re a competitive runner, try to run roughly twice your race distance during the session. If you’re running for fitness, try to begin at 6 miles, or work up to that level. Increase the distance over time to develop more endurance. Set the incline at 1 percent, which replicates the wind resistance you’d face outdoors. Improve your muscle endurance by performing calisthenics midway through your treadmill session. Simply plan your normal treadmill workout, but hop off the machine midway and do three sets of 10 squats plus three sets of five lunges with each leg. Get back on the treadmill immediately and complete your workout. Count the number of miles you run on the treadmill each week and try to increase that mileage by about 10 percent per week. Include a cool-down period of several minutes at the end of each workout to gradually decrease your exercise intensity. If you’re doing sprints, for example, cool down by jogging or walking. If you’re doing hill training, reduce the incline to zero at the end of your session. Begin each treadmill session with a light warm-up of five to 10 minutes. You should break a light sweat but still be able to carry on a conversation. Increase your walking distance and speed gradually over time. In an ExRx.net beginner's walking program, for example, you do 1-mile sessions at 3 mph in the first week and work up to 3-mile sessions at 4 mph by the 20th week. Perform both high-intensity and low-intensity workouts as your endurance increases. For example, do a shorter workout while jogging in one session and then do a longer, walking session the next time. Repeating the same workout often enough can result in a fitness plateau that prevents you from improving your endurance. Make at least one of your weekly workouts an interval training session. A beginner to interval training, for example, can alternate 90 seconds of walking at 2 mph with 30 seconds of brisk walking at 4 mph. Continue the pattern for 30 minutes. Increase the speeds, the treadmill's incline, or both as your endurance improves. Listen to soft, slow pop music when you’re on the treadmill. Exercisers in a 1991 study published in the “Journal of Sports Medicine and Physical Fitness” reported a lower rate of perceived exertion and a longer time to exhaustion when listening to the softer music, as opposed to louder, fast music or no music at all. Hold 1-pound hand weights when you use the treadmill. Pump your arms as you normally would while walking, jogging or running. Use hand weights only if you can maintain good form. Conclude your workout with a three- to five-minute cool-down in which you decrease your intensity. 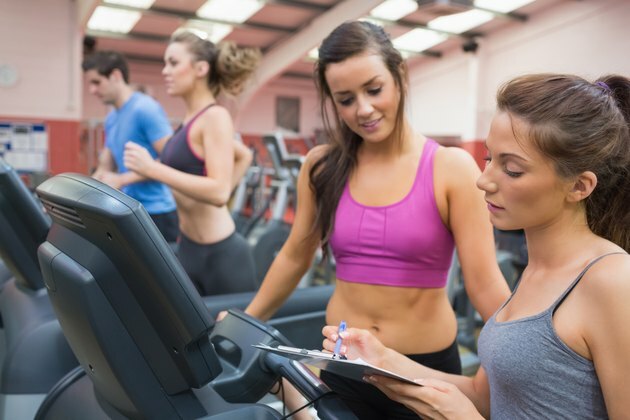 Consult your doctor before starting a new treadmill routine. Do You Get in Better Shape Running or Sprinting?